Ocean Exploration and Research mobile app. Want to watch the Okeanos Explorer live video feeds, but don’t want to be stuck in front of your computer monitor? Now, there’s an app for that! Check out our mobile app (for iOS and Android devices) that will allow you to bring the excitement of ocean discovery directly to your smart phone or tablet. 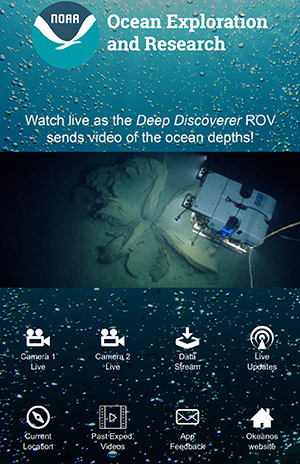 The app allows you to stream video LIVE from our remotely operated vehicle on the seafloor (at depths of up to 6,000 meters or 3.7 miles) to your mobile device. Join scientists from around the world as they explore the deepest, darkest reaches of our planet’s last unknown frontier, and hear them discuss their findings and watch as true discoveries unfold. The app also provides information on the location of NOAA Ship Okeanos Explorer and updates about our dives. As always, you can also tune in to the live video via our website.